Our design process looks to introduce something unique to every scheme we view. From the smallest garden to much larger projects including Schools & large commercial sites we aim to deliver something different.Utilizing local suppliers & using existing on site materials, we strive to create a design which is bespoke to you. Whilst taking into consideration environmental impacts, practicality & budget & the overall client requirement. With experience in the development of managed woodland areas, urban developments & private gardens our design team have developed a sensitive feel for the natural surround & look to draw inspiration from these areas. Our award winning team have designed & delivered numerous projects with particular emphasis on Nursery Schools & the early years. We aim to integrate children’s idea’s, dreams & aspirations into our schemes. Our designs are both challenging & interactive with an emphasis on fun, education & discovery. In addition to this Archer Landscapes have acted on a professional consultancy basis for a range of new designs & builds & have featured in Nursery World magazine. 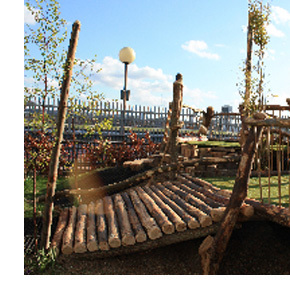 Hard & Soft bespoke Landscaping in natural elements, Sand Pits, Fencing, Safety Surfacing, Challenging Climbing Equipment, Unique Storage Units, Shade Sails, Textured Cycle Paths, Interactive Water Play Structures (inside & out), Willow Tunnels & Structures, Murals, Raised Beds, Benches, Activity Walls, Stone & Log Walls, Shrub & Sensory Planting. Bear Caves incorporating Living Roofs. Various Coppiced Chestnut & Timber designs, Bug Hotels & other bespoke hand designed rustic timber furniture. Working under close Supervision & using locally sourced materials our teams strive to produce both quality workmanship & a safe working environment. Our operatives work within strict Health & Safety guidelines, which feature ongoing consultation with the client as the norm. Our experience has taught us that careful planning is the key to a successful build, with this in mind we taylor the construction requirement around the specific needs of the client. Following completion of all works the Company offer a fully intergrated Maintenance service for both new install & existing amenities. Our vastly experienced team work hard to ensure that original design features are maintained to a high standard, with every effort made to ensure that the client continues to enjoy their facilities to the maximum. All pricing schemes produced by Archer Landscapes Ltd are bespoke & confidential to the client. They aim to meet the budget requirements of the individual / organisation involved and can be tailored to suit accordingly. Our experience has taught us particularly with larger projects that long term staged planning is often the key to both a successful build & a quality finished product. Our Consultants being readily on hand to offer advice on both cost effectiveness & practicality.